For newcomers, stepping onto a street in Ho Chi Minh City requires something more than courage. Particularly for folk of the suburban American breed, interacting in any way with the city’s streets demands a sense of recklessness. To those accustomed to over-engineered roads where every stripe of paint, metal signage, and streetlight is meticulously examined and purposefully installed, traffic in the former Saigon is utter chaos. Stoplights and yield signs—when present—offer drivers some indication of their place on the street, but overall, motorists do as they please. They pack multiple vehicles across one lane, swerving freely between lines as though the paint weren’t even there; they mount sidewalks to circumvent bottlenecks, honking away pedestrians in their path; they park their vehicles smack in the middle of would-be walkways; and like echolocating bats in a cavern, they blast their horns when approaching an intersection, assuming the sound is more effective protection than actually stopping to look for oncoming traffic. Motorists wouldn’t be as emboldened if it weren’t for the vehicles they drive. By and large, the 8.5 million residents of Ho Chi Minh City navigate their metropolis not by car, but by motorbike. A tendency throughout Vietnam, motorbikes rule the streets of Saigon. They carry whole families of four, babies nestled between the steering wheel and seat in a special high-chair, or with toddlers standing on the seat, sandwiched between two adults; they shlep vendors and their gravity-defying wares of vegetables, clothing, furniture, or chickens; they shuttle youths from school to music classes, guitar case in tow; they haul enough dirt to fill the floor of a house; and they glide by as deliriously happy pups stand with two paws on the steering wheel, drool from their flapping tongues sprinkling their owner’s faces. The "critical mass" of motorbikes is evident on almost any street in Saigon. These two-wheeled vehicles have pervaded the lives of the Saigonese to a profound degree, seen in great number in the narrowest of markets and busiest of roundabouts. Even ride-share apps have adapted: Grab and Uber, the competing transportation network companies in the city, employ a massive fleet of motorbikes to shuttle single riders to their destinations. To cross a road, pedestrians must embrace the motorbike philosophy: Trust that all will behave as a collective mass, flowing through streets and around obstacles like a river. The other motorbike philosophy that comes in handy is to accept the power of numbers. When traversing roundabouts, for example, motorbikes hoping to penetrate the onslaught of traffic wait until a critical mass of similarly-oriented drivers has formed, and then together push against the river until it is miraculously redirected in the bearing they wish. None of this would be possible if motorists were driving cars instead of their two-wheeled machines. In a city where motorbikes are the dominant form of transportation, rush hour often seems more like a river of traffic than the gridlock found in car-centric cities. Life in Ho Chi Minh City wasn’t always geared towards motorbikes. Inhabited as far back as the 1600’s, settlements here have only known this form of transportation for less than a century—enough time, however, for streets and sidewalks alike to become the domain of the motorbike. Thus it’s no wonder that, by and large, people in Saigon choose not to walk—a subtle reality that makes the sunburned tourists trudging through the streets on foot stand out even more. When asked, locals say the heat, humidity, and sun deter them. Why walk, they insist, when your motorbike could get you there faster and keep you cooler? When you already have a motorbike at your disposal? When it isn’t safe to be a pedestrian on the streets? Locals may have a point. The heat here is not for the weak. The Vietnamese, in their efforts to preserve fair skin, command respect for covering every inch of their body with jackets, pants, socks, and face masks amid the sweltering sun. Motorized alternatives, abundant on every street, are ubiquitously owned and much breezier than walking. Add to that an often unpleasant and unsafe pedestrian experience, and suddenly it seems the Saigonese have a strong argument in favor of riding motorbikes. Besides the heat, and motorbikes using the sidewalks as an extension of their travel lanes, walking in Saigon is unpleasant simply because there is often no place for people to walk. “Sidewalks” regularly serve as places for drivers to park their motorbike while they eat, shop or—in a surprising feat of balance—sleep on their bikes. Most other “sidewalk” space is commandeered by vendors selling street food, drinks, and other knickknacks, or mechanics welding motorbike parts with little to no protective gear. The little sidewalk that remains available for pedestrians is often a jagged mess of uneven tiles, which makes traversing them feel more like hiking an unpaved trail than walking through an urban environment. Pedestrians are often pushed off the “sidewalk” to the edge of the road, trusting that motorbikes will weave around them after a short, sharp “courtesy honk.” Perhaps the best summation of the hierarchy in this mobility equation is the sloped nature of Saigon’s curbs, meant to ensure motorbikes—not wheelchairs, elderly, or children—are able to access all levels of the streetscape. In many regards, motorbikes have done great things for transportation in Vietnam and elsewhere. Motorbikes meet most everyday transportation needs, shuttling people, groceries, school supplies, instruments, and cargo. They are an achievable investment for many, offering privatized and individualized mobility for people in a developing country. They are more efficient than cars, taking up less space and fewer resources to build. As far as parking requirements go, motorbikes are the urban planner’s and business owner’s dream: the land needed to store motorbikes pales in comparison to that required for automobiles, a calculus in favor of the city’s historic tendency towards compact development instead of sprawl. Motorbikes easily fit into Saigon’s maze of a street network, navigating alleyways that even Smart Cars couldn’t squeeze through. In a city of nearly nine million, the small size and adaptability of the motorbike is indispensable. Five or six (or more, depending on the creativity of the parking attendant) bikes fit in the footprint of an average-sized automobile; high-torque, specialized motorbikes haul construction materials to tiny job sites too narrow for trucks; and the public realm itself has evolved, where gently sloped curbs and ramps allow bike access to every level of the street. And yet, motorbike culture comes with costs. While traffic often seems to be functional entropy, it is not always a poetic success. In fact, motorbikes were responsible for 14,000 deaths in 2016 in Vietnam. Parting the sea of traffic may feel like divine intervention, but evidently it doesn’t always part as intended. Predominantly gasoline-dependent, motorbikes produce greenhouse gases, diminishing air quality and threatening public health. Electric motorbikes could help reduce air pollution from private vehicles—a concern in a city where the majority of people wear face masks to filter out the smog—but locals note that the rainy season and electric bikes don’t always mix well. Despite the millions of motorbikes throughout Saigon alone, the Vietnamese are not irreversibly tied to their scooters. In Ho Chi Minh City’s District 1, for example, locals abandon their bikes to indulge in the pedestrian-only refuge of Nguyen Hue, a half-mile long “Walking Street” that extends from the French-style city hall to the river. While remarkably desolate during the day—when the midday sun and high temperatures mock the minimal amount of shade—Nguyen Hue is the place to be at night. Even on a Monday evening, visitors can find crowds of locals and tourists munching on grilled corn, slurping milk tea, snapping selfies, and strolling along the promenade. 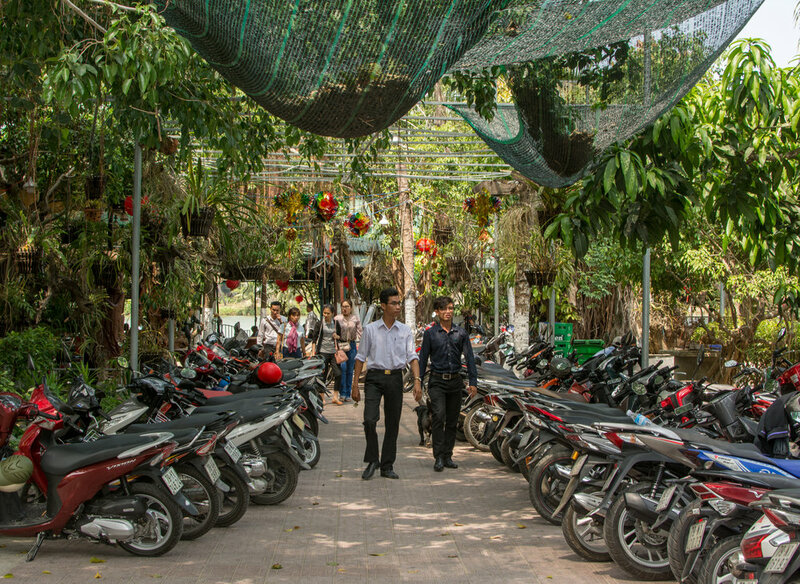 Perhaps in recognition of Nguyen Hue’s popularity, and certainly in a nod to the nuisance motorbikes can pose, the government has plans to eventually ban motorbikes from the city center, expanding the motorbike-free zone over time. 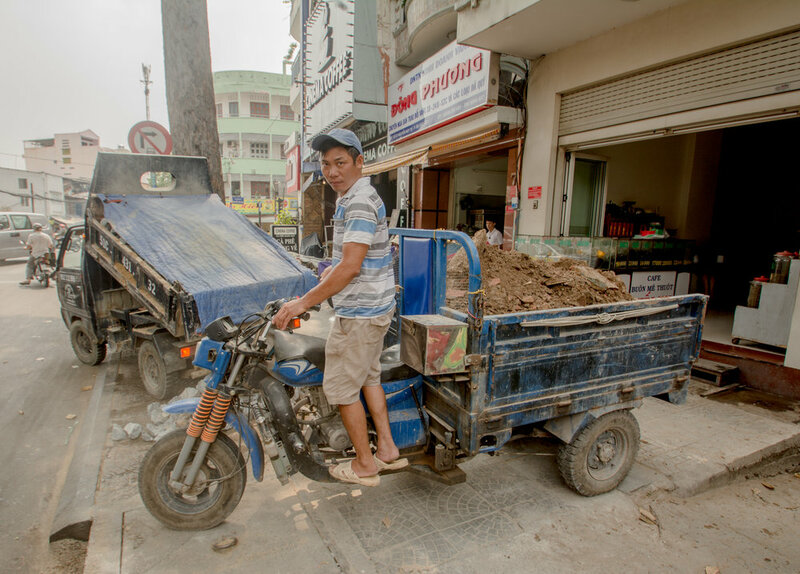 As hard as it may be to imagine the motorbike haven without its wheels, other cities in Vietnam have seen success from similar policies. In Da Lat, a town in the southwest highlands famous for growing coffee and flowers, pedestrians are given complete reign of the city core on weekend nights. Motorbikes are blocked from entering the “Walking Town,” and the crowds relish in the freedom that comes with conquering the streets and night markets on two feet. Top-down policies to limit or eliminate motorbike and car traffic have seen success in some Vietnamese cities. 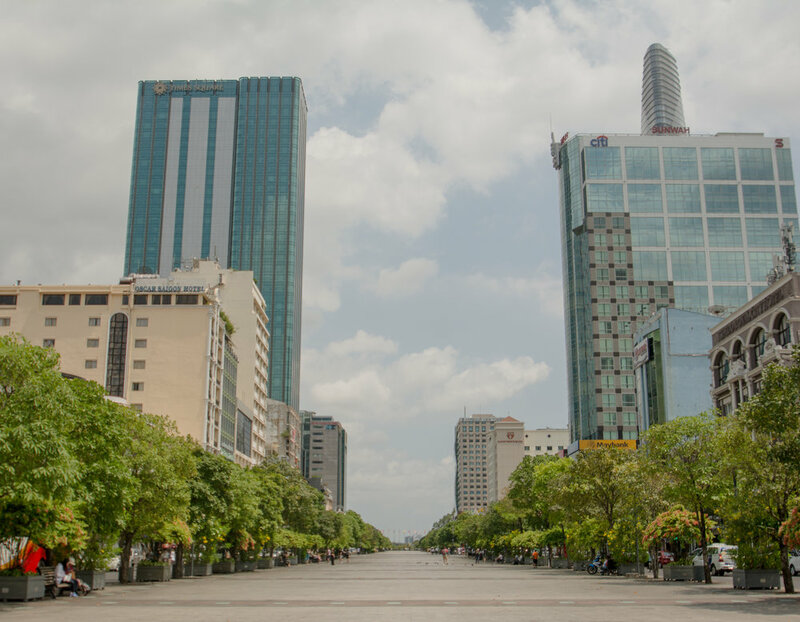 Nguyen Hue, Saigon's pedestrian promenade, stands deserted during the day, when the sun, heat, and work duties deter crowds. At night, however, the "Walking Street" teems with locals and out-of-towners enjoying city lights and cooler weather. 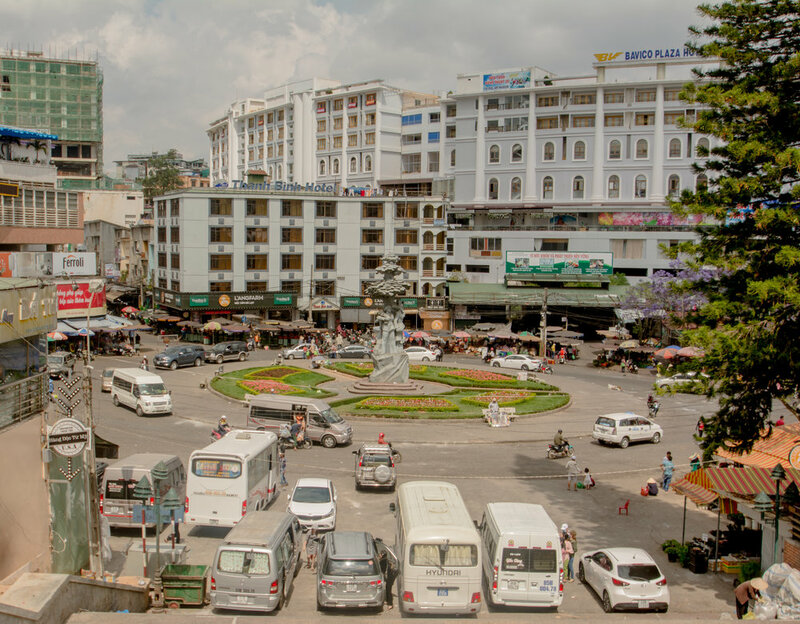 Da Lat's city center, flush with tour buses and motorbike traffic in the daytime, welcomes massive crowds during its pedestrian-only nights on the weekends. Banning motorbikes from Saigon’s center becomes more palatable when daytime mobility options other than walking and taking taxis exists. Fortunately, the city’s new metro system is already under construction, with the first of its many planned rail lines projected to open by 2020. Time will tell how residents will react to their expanded transportation options, but if the city really wants to move away from the motorbike life they need to re-evaluate sidewalks and establish a more inviting pedestrian experience. Saigon’s motorbike culture offers one more important lesson for urban planners: It is possible to have a strong public realm and active streets when the predominant mode of transportation is not two feet. It’s easy to think of Ho Chi Minh City as a people-oriented place—in spite of the dizzying motorbike traffic and questionable walking facilities—because it absolutely is. Its streets do not need “activation,” for they are already bustling with activity. Perhaps what separates the streets of Saigon from the streets of Manhattan, for example, is that the Big Apple’s streets are crowded with people rushing through, whereas Saigon’s streets are overflowing with people who are sitting, chatting, lingering. What is it about Ho Chi Minh City’s streets that invite people to stay? Is this phenomenon due to the more compact modes of travel, like motorbikes or push bikes? Or does this happen in car-oriented cities as well? How about transit-oriented cities? Or is it not even related to transportation at all, but a result of the Vietnamese culture and customs? Is it simply the fact that the Vietnamese allow and expect their streets to be active, and therefore experience what they expect? Auto-oriented cities around the world would be wise to acknowledge the opportunities that come with motorbikes, amid the costs. The Vietnamese show that even elderly, pregnant women, and families embrace scooters as a convenient, private, and individualized mobility option. In return, they gain cities that can be more human-scale, conserving land for houses, businesses, farms, industry, recreation, and tourism instead of sacrificing land to park cars. Chaotic traffic is not inherent to motorbike-dominated cities, and would certainly be remedied with a dose of American traffic engineering. Perhaps in adopting motorbike-oriented development, cities like Orlando, Florida might be able to transform underutilized land and over-stretched roads into more places for people to live, eat, and linger.